We appreciate the opportunity to create a backyard environment that will bring you pleasure and enhance the value of your home for years to come. When you call on Sun Valley Construction Inc. for an estimate we don’t just come out to sell you a pool we meet with you to listen to your ideas evaluate the options available and determent what style and feel you are trying to achieve after careful measurements are taken and an assessment of the area is done, our designer create a detailed professional pool design for you to review. After the design of the in ground swimming pool is finalized and all of your selections have been made you can leave the rest to us, we take care of the permits, inspection and provide you with a highly trained construction superintendent who will act as your personal liaison throughout the duration of the project. To make it easy for you to visualize the process we have broken it down into the follow steps. We welcome you to contact us at any time with question you may have about your pool construction. Before we begin excavation we mark the area where your new pool will eventually be situated. The layout is based on your custom design, and upon your approval we will begin the digging process. Now it’s time to dig! It usually will takes a day to complete the excavation process depending on a few variables becuase of ground conditions. Steel reinforcing add strength and life to your in ground swimming pool shell, we use reinforcement to meet all of the county codes to specification so a county inspector can come out to you project and inspect it. After that point the county inspector will provide you with an inspection approval and authorization to gunite your pool. We use high grade schedule 40 PVC pipe. It’s designed to prevent leaks and deterioration, all the connections are solidly bounded and the entire plumbing system is hydrostatically pressure tested. 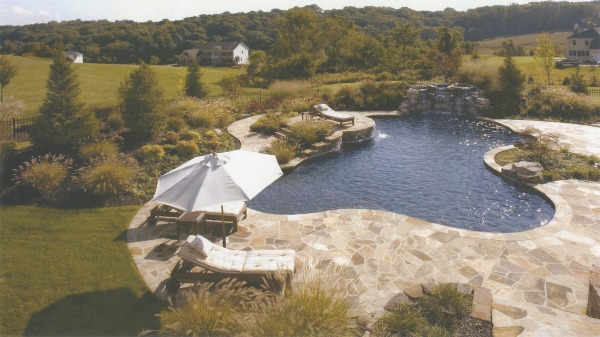 Gunite is pneumatically applied under great pressure to bound tightly around the steel to create your pool shell. We install the pool coping of your preference around the top perimeter of your pool shell with the tile along what will be the waterline of the interior of your in ground pool. You will have many option of tile and coping to choose from. We will set your pool equipment and have it wired by an electrical contractor and inspected by a county inspector which is mandatory. A wide variety of options are available to you when selecting the decking for your pool including brick, pavers, flagstone, color concrete, sun deck, exposed aggregate, and much more. To comply with Virginia law there are a number of finishing option available for fencing, Virginia law states that there must be a barrier with self-closing and locking gates to prevent unauthorized people from entering the pool area without your permission. Cleaning of pool shell and applying the finishing surfacing coat of your pool, which we call the plaster process usually after the plastering is completed that same day the pool gets filled with water to help with the curing process of the plaster at this time your about two days away from start up. Now that your pool is filled with water we will start up your pool equipment and add the necessary chemicals to the water to make it safe for you to enjoy your pool. The Last step of construction process is a complete site cleanup and the final grading. Building around our region is very critical because of freezing and thawing, which happens after really hot summers and really cold winters using the correct materials for your project is essential for the durability of the job. Choosing of these materials, placing expansion joints, control joints, appropriate subbase, compaction, slops, drains, reinforcement fibers, wires mesh, and steel will insure a strong well-constructed project to last and give you peace of mind for years to come.